Tossing up some ideas involving a divining pendulum. 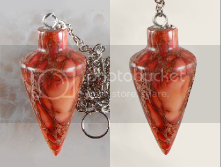 The idea for the SCP is a small pendulum suspended from a chain. When held by a subject over a detailed map or blueprints, the pendulum will begin to move and rock until it is held over a specific location. Then it will tightly circle over the specific location on the map. The subject is then inclined to go to the room selected on the map and kill themselves with whatever implements are there. Could lead to some interesting scenarios and testing with the D class using a map of the facility. Subject is sent to the bathroom, where he attempts to drown himself in the toilet. Subject is sent to euclid/safe SCP containment units and tries to use the SCP to kill himself. Subject is sent to the room he is already in with the pendulum and attempts to gouge out his own eyes with the pendulum, but is subdued before causing fatality. If this sounds similar to any other SCP, please let me know. Also throwing around the idea of every instance not resulting in suicide, but what the D class does to themselves in each room has something to do with whatever crimes they have committed in their past. The other idea, of the D-Class facing "punishment" for their crimes is about as cliche an idea as you can have. Also, I'm not really getting any sense of story or background here. It's just a weird object that directs you to a place and makes you kill yourself. Why should I care? What makes it special? What would make it interesting? Also also, for future reference, It should be "The subject", not just "subject".